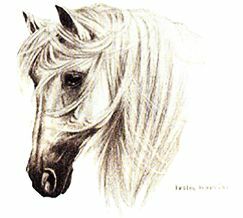 The ideal horse head conformation varies dramatically from breed to breed, but all breeds are valued for a relatively broad forehead. A broad forehead provides increased sinus capacity, thus there is more room for air exchange through the air passages, and a large surface area for facial muscles that assist in opening the nostrils for good air flow. A good head in any breed must also have large eyes, proportionate ears, large nostrils, good width between the jaws, and a smooth joining of the head to the neck. A wide jaw or throatlatch allows more than 4 fingers between jaw bones (greater than 7.2 cm wide) A wide throatlatch may make a head appear less flexible, but really it has no effect on the horse accepting the bit and does not restrict air flow. The horse is good for any activity. The ability to breathe deeply is critical to the success of a horse in any endeavor, so any conformation flaw that restricts breathing capacity is a fault across all breeds. Contrary to popular belief, a deep dish in and of itself does not restrict airflow, rather, it allows for long periods of aerobic activity, such as Endurance riding. 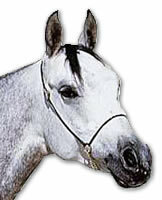 This type of head is seen in light riding horses such as the Arab horse. The horse has a convex profile. Properly proportioned, this type of head has adequate sinus capacity. particularly suited for sustained bursts of power such as that needed by Draft horses and lighter riding breeds noted for their power. The fine quality Andalusian pictured above right, exhibits a roman nose. Opening of the nostrils (the nares) is narrow and somewhat restricted, limiting ability to expand the nostrils for breathing while working hard. Small Nostrils can occur in any breed. The upper jaw extends further out than the lower jaw, with the horse having an overbite (parrot mouth). 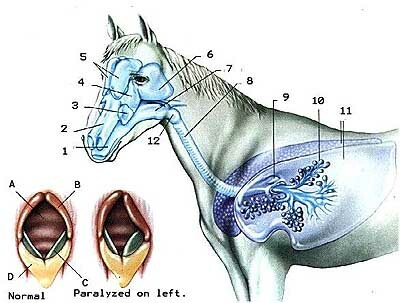 Or the lower jaw extends farther out than the upper jaw, with the horse having an underbite (sow mouth). Both defects can affect the chewing of the horse and the horse’s ability to clip grass. Both defects are fairly rare. This is a common fault, seen mostly in thoroughbreds, standardbreds, racing and speed horses who compete in horse racing, steeplechase, eventing and polo. The horse may suffer from restricted upper airway or air turbulence due to paralysis of recurrent laryngeal nerve (RLN). This is because the cartilage collapses into the airway space. This causes exercise intolerance, and may lead to stops at a fence due to muscular fatigue. 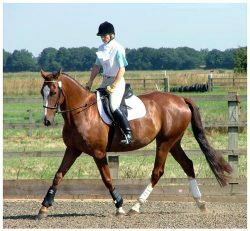 A dressage horse or horse that needs to go on the bit in a collected frame may be resistant to do so because flexing at the poll further narrows the airway. However, the horse does not necessarily exhibit a roaring sound. Symptoms include: resistance to bridle, bracing through the poll, neck, and back, difficulty in training to the upper levels. Bottom line is what I really found is ventolin evohaler 100 micrograms price a great..